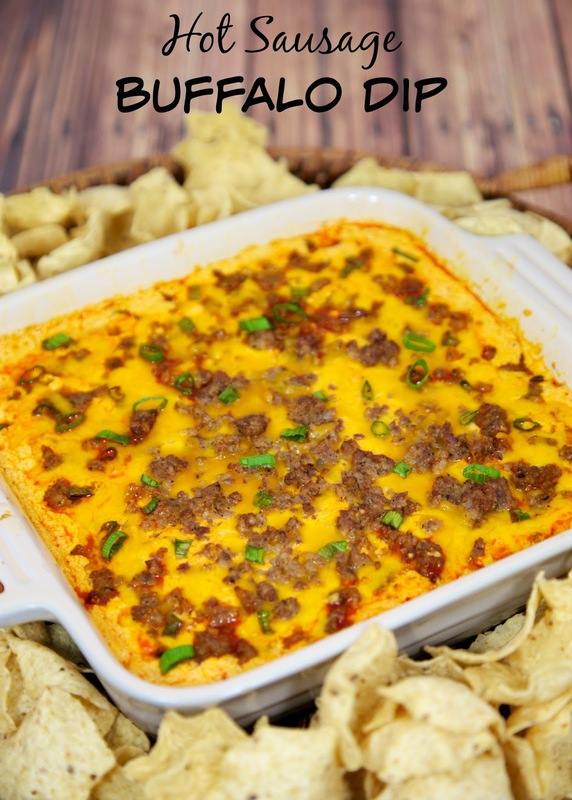 Hot Sausage Buffalo Dip - cream cheese, sausage, cheddar and buffalo sauce - I could make a meal out of this dip! Great for parties and tailgating! 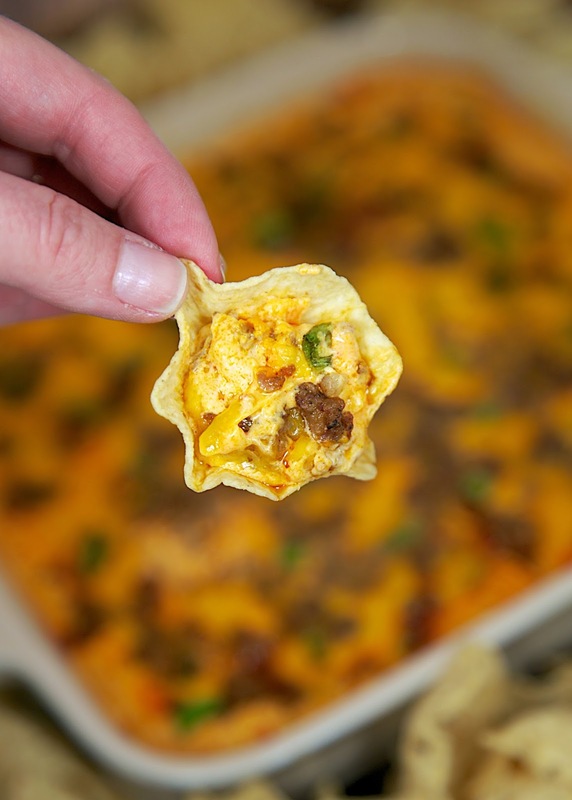 Everyone RAVES about this easy dip recipe! Always the first thing to go! Now that the holidays are over we can get back to focusing on football. The first playoff games in college football were played yesterday. There is one more game to determine the champion. The NFL is getting ready for the playoffs. There is still a lot of tailgating to be done! I made a few swaps for this dip, and I really couldn't tell a difference. I swapped the regular cream cheese for Greek cream cheese. I used some reduced-fat cheese, and turkey sausage instead of regular sausage. If you aren't sure about the swaps, you can always use the regular products. But honestly, we really couldn't tell a difference. We loved this dip. We also loved that it was a bit healthier for us. Yay! for Little Victories! A word of warning about this dip. It does have a kick from the wing sauce. Make sure to adjust the amount to your personal preference. We like it spicy, so we went all-in! In a mixing bowl combine sausage, cream cheese, sour cream, ranch dressing, wings sauce, and 1 cup of cheddar cheese. Pour mixture into a lightly greased 8x8 baking dish. Top the dip with chopped green onion and remaining 1/2 cup cheese. Bake for 25-30 minutes or until bubbly. This dip sounds so delicious, gotta give it a try! Yum! I've never seen Greek cream cheese? My little victory for today is that I got to sleep in and am feeling rejuvenated and productive! Great looking dip Steph. Tailgating has been a sad affair for us SEC fans the past few days. My little victory for today is packing my lunch. Starting the new year off right by not eating out and hopefully I will stick to it! I packed leftovers of the Black Eyed Pea and Smoked Sausage Soup! Can't wait for lunch. This dip looks great I love substituting reduced fat items in dishes. My victory is starting the day with a green smoothie (despite the fact that it is cold outside). Thanks for a healthier dip and the give away! Dip looks great and awesome giveaway! Would low-fat cream cheese work in place of the Greek cream cheese? I've never seen that. This looks yummy. 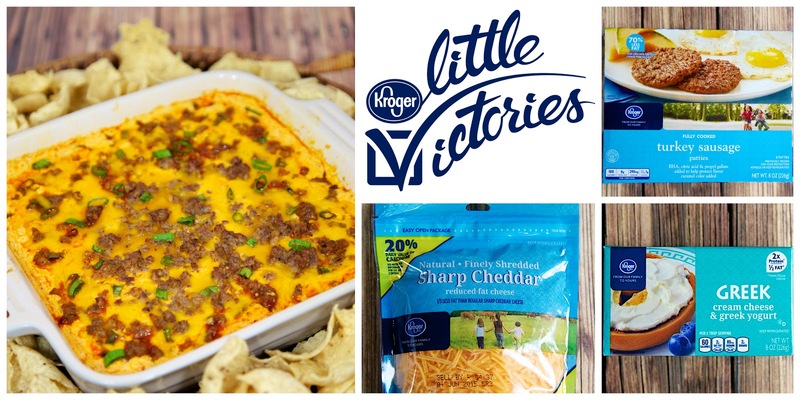 Got to try this dip for Sunday. GO COWBOYS!!! I've tried the low fat versions and you really can't tell a difference. Thanks for the recipe! I love "buffalo" flavored dishes! This dip looks YUM! Thanks for sharing. Today I slept in and met a girlfriend for a 5.5 mile walk. Victory! It's a little victory but I'm getting all my Christmas decorations put away today FINALLY. I reorganized one of the closets today! Small victory: kitchen and bathroom cleaned. Recipe looks great. My little victory today was making a batch of flu tonic that I've had pinned for weeks. I'm determined not to catch this nasty flu going around. I sat down and made a chart for the "spring" cleaning I'm going to tackle during my week off of work next week! Have had the flu, so just getting up and dressed and moving around has been a big victory for me. This dip sounds amazing and I will definitely look for Greek cream cheese! My victory today was cooking an easy taco soup for dinner! Will surely try this dip! I LOVE dips but usually HATE "healthy food". This looks like it could be the best of both worlds! Im so excited to try it! Victory today is hubby's gonna cook dinner! looks yummy! victory is the hubs is shampooing carpets!! This dip looks and sounds amazing. I am going to try replacing the sausage with diced Rotisserie chicken (don't eat sausage) and see how it goes - should be awesome ! Thank you for sharing this recipe ! I plan on making this tomorrow for Sunday afternoon football! Thank you for the yummy (and healthy) recipe! Love the idea of adding buffalo flavor to a sausage dip. Pinned! My victory for today is I'm up and at it early, started laundry and have dinner in the crockpot. Made it back home safely today after the snow and ice on the roads! My little victory for today was when I got all 4 of my little ones to take a nap at the same time which means I get to take a shower while the sun is up. Victory dance! My little victory for today is accepting my body the way it is right now and not feeling bad about myself anymore. My victory was making a grocery list and sticking to it! My little victory was to make meals for a week out of food we already had in the house instead of wasting it. My victory today is feeling well rested after a good night's sleep. My victory today was packing my lunch for the 4th day in a row this week! Thinking church potluck/social...anyone try this in a crock pot?